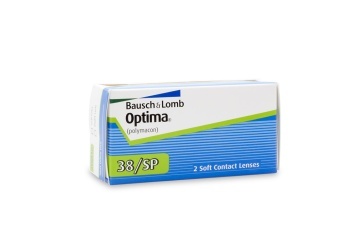 The Optima 38 is a soft daily contact lens from Bausch & Lomb. Convenience, ease-of-use, and crisp, clear optics have made this lens a consumer favorite for over a decade. Comes with a spare pair of lenses. The monthly disposable Optima 38/SP contact lens is a soft lens manufactured by Bausch and Lomb. The process that is used is the Reverse Process III technology and the lenses are used to correct myopia and hyperopia. These lenses are a daily wear lens and are only for a single vision lens. Your eye care professional will determine the type and replacement schedule that you will use. These lenses are designed for a monthly replacement schedule, but your eye care professional will determine how often you should replace your lenses. They are tinted for handling ease and will not change the color of your eyes when they are on the eye. The monthly disposable Optima 38/SP is part of the Soflens family of contact lenses. These lenses are available to consumers as a spherical lens and has a 38.6% water content. Make sure that you follow your eye care professional's instructions for the cleaning and replacement schedule for your monthly disposable Optima 38/SP contact lenses. They are designed to be a comfortable and powerful single vision lens. If you have astigmatism, these lenses will not be appropriate for your use. Ask your eye care professional for the right contact lenses for you.